Images are copyright of Will Gluck Productions and Screen Gems. While any representation of reality and Hollywood can be as stretched as their concepts, the one thing they seem to nail more often than not is how overrated popularity can be. I had actually wanted to see this film from the previews alone, which is rare for a teenage angst offering, and it delivered on my anticipation of enjoyment. The aspect that won me over was that it was a rare spot on satire of how shallow humanity can be, even in the developing years that precede adulthood. In many ways it reminded me of “10 Things I Hate About You,” which I think I need to watch again very soon. 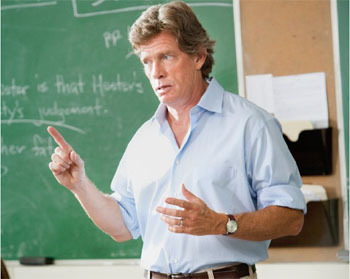 “Easy A” is social commentary we need to cut loose from an otherwise stressful existence. The story focuses on a young girl named Olive (Emma Stone), who is not exactly upset with being unnoticed by her classmates, but still curious of the unobtainable popularity status. Like many students, she portrays her life as slightly more interesting than it actually is and even that seems to garner little change in anything. Well, that all changes when Olive is pressured into admitting to something she didn’t do by her friend Marianne (Amanda Bynes) because of a lie she told and before she knows it, she actually starts getting noticed... for being loose and easy. She quickly finds out that while she gets a lot more attention, she actually starts to share more in common with a certain outcast in “The Scarlet Letter” and wishes she could just have the crush of her dreams, Woodchuck Todd (Penn Badgley). The way the film portrays her struggle with doing the right thing and using her downfall to her advantage is done in a way that may require oxygen from so much laughing. This is not a movie for younger audiences and you actually have to have a sense of humor to appreciate it, but barring that, it should appeal to anyone who likes things to be witty. All of the jokes are suggestive and unlike low brow flicks like “Not Another Teen Movie,” this will be something worth spending money to watch more than once. In the end, I would not change a thing and really wish it had been considered for far more attention than it actually received. I will consider this as a purchase for my DVD collection and note you can’t go wrong in checking it out. This earns “Easy A” four and a half out of five affairs.